﻿ Kamandhani Cottage, Bali | FROM $17 - SAVE ON AGODA! "This hotel is perfectly satisfactory for accommodation and s..."
Have a question for Kamandhani Cottage? "Had an awesome stay guys, thank you!" "A hotel shuttle bus in the evening was helpful." "Pool is good and clean." Situated in Ubud, Kamandhani Cottage is the perfect place to experience Bali and its surroundings. Situated only 3 km from the city center, guests are well located to enjoy the town's attractions and activities. 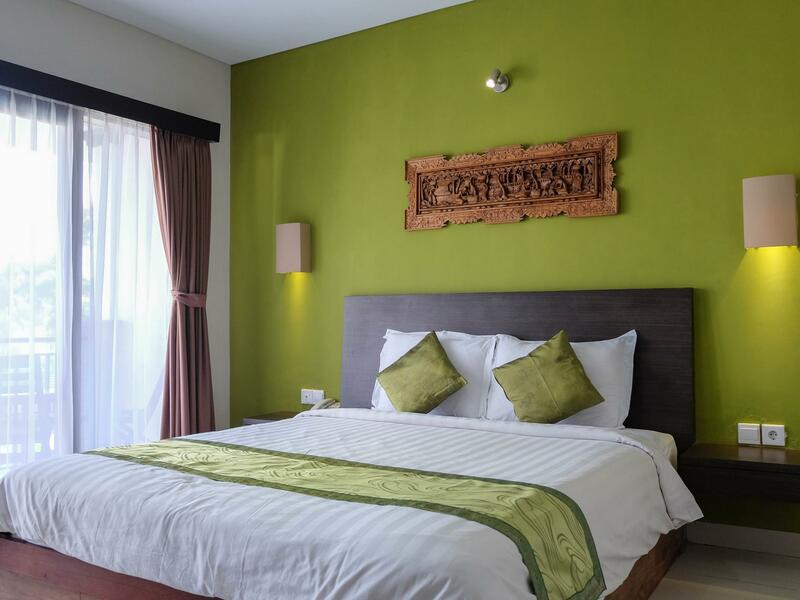 For sightseeing options and local attractions, one need not look far as the hotel enjoys close proximity to Agung Rai Museum of Art, Gajah Mas Gallery, Monkey Forest Ubud. Offering hotel guests superior services and a broad range of amenities, Kamandhani Cottage is committed to ensuring that your stay is as comfortable as possible. This hotel offers numerous on-site facilities to satisfy even the most discerning guest. 12 rooms spread over 2 floors provide a warm and pleasant home away from home. Modern comforts such as television LCD/plasma screen, internet access – wireless, internet access – wireless (complimentary), non smoking rooms, air conditioning can be found in selected rooms. The hotel offers an excellent variety of recreational facilities, including outdoor pool, spa, massage, pool (kids), horse riding. Whatever your reason for visiting Bali, the Kamandhani Cottage is the perfect venue for an exhilarating and exciting break away. "Everyhing you could need from a 3 star hotel - great value!" Lokasi diujung gang buntu. Kolam renang terlihat kotor. Kamar dan kamar mandi sudah usang dan berbau tidak enak. Handuk, sprei, bed cover, gorden, kusam. Sempit. Wifi tidak berfungsi dengan baik. Balkon kotor. The location is good but it's not in along the main road so it is very quiet. All you need is in walking distance (restaurants, convenience stores, car/motor rentals and tours, etc.) The room itself was okay. Bed was big but the bathroom is a bit old. They did not provide any toiletries (only towels). Pool is good and clean. we booked three rooms under two bookings and the hotel mistakenly thought we booked only two rooms and they were fully booked. got frustrated so they offered us to stay at a nearby hotel but we refused. we requested to get a refund for the one room they overlooked and got our money back. Facilities were good but starting to get dated. Walkway down to motel is a dirt pathway and needs to be cleaned up but overall very affordable and comfortable place to stay. Small and family friendly budget hotel with clean room, comfortable bed and pillows, clean pool, helpful staff, however, a very rough lane to be negotiated by taxi or foot, quite far from the main drag of Ubud (30 mins walk), no bath mat or hand towel provided, simple breakfast with freshly cooked eggs and toast, fruit and juice, instant coffee. This hotel is perfectly satisfactory for accommodation and spend your money on the excellent food choices, and cultural sights in this area. A hotel shuttle bus in the evening was helpful. The bed linen and the towels were dirty. The bathroom is old, smelly and dirty, too. The breakfast was okay: variations of egg or pancake and toast with butter / pineapple marmalade, coffee, milk, tee and one sort of juice. The pool is not very big, but good to refresh when it's hot. There is no pool bar, they will order the food from a delivery service. However there are some restaurants in walking distance (we highly recommend the Mexican one). The bed and room was good. Also the Pool. But the bathroom was old and dirty. Smelled like urine, cockroach in the bathtub. And water didnt flow away from tub. Also the refrigorator did not work. Staf had a New excuses every Day for not reparing this. So I think they lied every time. Dissapointing stay! ! I was staying here 2 years ago. It was fine. This time the place looks as it needs proper refurbishment. Mould on ceiling - then we have got another room where door don't even close properly. Shower curtain was so dirty you didn't want to touch it. Very disappointing. At this price range you can get way better quality. Good location. Cleanliness could use some work. Dirty floors, sheets, and bathroom. I've been living and traveling in SE Asia for 3 years now so my expectations for any hotel are never that high so I'm usually never disappointed. However, I cannot say the same for Kamandhani Cottage. I was very much disappointed with my stay. Upon checking into our room, it was clear the room hadn't even been cleaned. The floors and sheets were filthy. The drain from the bathtub was laying in the middle of the bathroom floor leaving a big gaping hole in the tub. There was an awful smell in the bathroom that took over the entire room if we didn't keep the door closed at all times. There was a ball of hair all caught up in the drain on the bathroom floor that hadn't been cleaned in who knows how long. Unfortunately we arrived at midnight and there wasn't much we could do but sleep. The next day we woke up to find the pool water was black and "closed for service" and remained that way the first few days of our stay. On the plus side, we found the location ideal and the young lady at the reception was very friendly and helpful in helping us coordinate motorbikes and plan out our day. The breakfast was nice and views were very pretty from the balcony. I think the cleaning staff really needs an upgrade. Staff friendly. Quiet pool area. Close to monkey Forrest. Value for money. Maybe linen on tables could be changed more regularly at breakfast, and change the breakfast menu. 4 mornings of the same limited choice. Value for money, Room condiotion is ok . nice view from corridor. shuttle to town from 6-9pm. Not close to Ubud palace tho. Walkway from main road to hotel is a bit dark tho. all staffs are very friendly and helpful. always suggest good restaurant. the room floor is dusty, not comfort to walk with barefoot. spider net found on ceiling. after request change room, it's better. location off main road, a peaceful environment. new building arise block the paddy field view. motorbike rental available. the narrow road access is dark and horrible at night. A nice and comfortable stay with privacy. I was pretty disappointed with this hotel. The bathroom smelt really bad, so much so I tried avoiding it! It smelt like sewage. I had a ground floor room whih was disappointing as I would've liked some more privacy and a view. I was there for nearly a week and wish I'd booked in somewhere else. Can walk to town but it's not close. The pool is nice but only have a couple of chairs and the sun rarely hits the area so it's in the shade a lot of the time. I won't be returning to this hotel or recommending it to friends.